Standard - $29.99 Only 1 left! You're a lover of all things lavender, a person who's passionate about purple, a devotee to the lilac hue and by golly, your home reflects your admiration. Every room is painted a different shade of plum and all your knick-knacks match perfectly. Even your furniture features periwinkle and plum patterns! You're a purple princess and it's about time your residence's exterior echoes it. Don't head to Home Depot for gallons of house paint just yet; just use a projection lightshow to achieve the effect you want. This decoration is perfect for outdoor use on garages, homes, or decks, seasonally or all through the year. Since the swivel yard stake easily attaches to the grass or any soft ground, this decoration is intended for outdoor purposes. 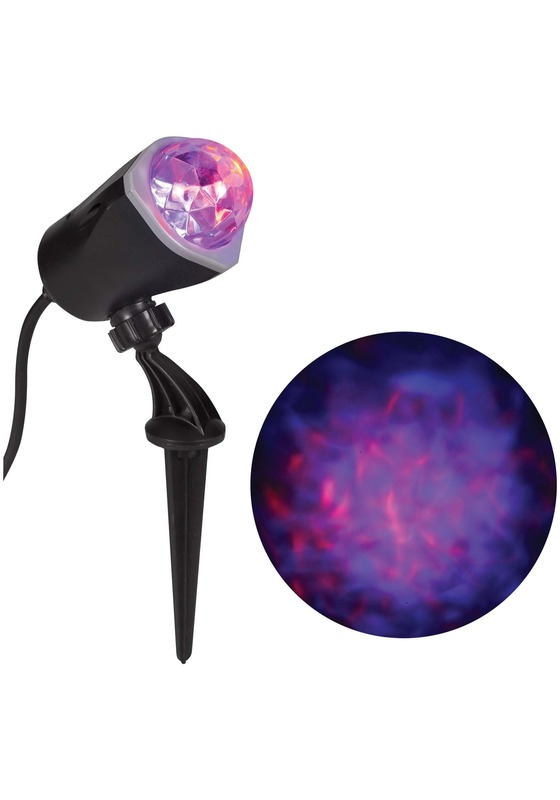 The purple LED light is surrounded by black plastic casing to secure the bulb and it's capable of projecting up to 15 feet away. Please note, this decoration uses a standard U.S. outlet. Use this decoration to set up a spooky scene in your front yard. Shine it on a group of tombstones, a scarecrow, or a few hanging ghosts and be sure to check out all of our projection decorations.